School colors are the colors chosen by a school to represent it on uniforms and other items of identification. Most schools have two colors, which are usually chosen to avoid conflicts with other schools with which the school competes in sports and other activities. The colors are often worn to build morale among the teachers and pupils, and as an expression of school spirit. 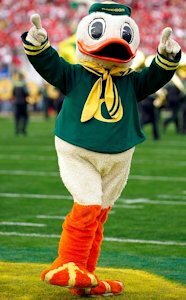 University of Oregon Mascot "Puddles"